Still Walking, the new film by Hirokazu Koreeda, explores the complexities of family life in modern Japan, in part through the struggles of a male character who ultimately finds some kind of redemption. Two other recent Japanese films have explored this theme with style and expert storytelling: Tokyo Sonata by Kiyoshi Kurosawa, about a man ashamed at the loss of his middle- class job, and Departures by Yojiro Takita, the story of a man who leaves his wife and finds solace cleansing corpses in burial ceremonies, a task considered “untouchable” in some societies. 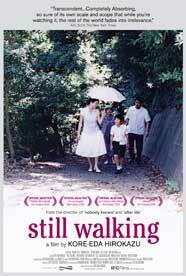 Still Walking is an elegant and subtly directed film that explores similar ground but with less physical action and a great deal of careful interaction. Ryoto returns to visit his aging parents in the home where he grew up on the fifteenth anniversary of an event that still haunts the family. The oldest son died trying to save a drowning friend, and his memory is held in such high esteem that it overshadows any attempt that Ryoto makes to establish his own identity in the eyes of his parents. Complicating the visit is the past of his new wife, a widow with a young son. While Ryoto and his family travel on the bus, we meet his mother, Toshiko, preparing vegetables in the kitchen with her daughter Chinami. Chinami is a free spirit who has no use for the proper preparation of radishes, and the contrast with her mother’s culinary gravity sets a tone of levity that persists throughout the story, never letting even the most serious moments become too weighty or hopeless. The effect of the careful compositions, gradual pacing, and subtle and realistic acting is that the storytelling draws the viewer into the complex emotions of the family gathering, slowly revealing the strained state of each relationship. Toshiko and her husband Kyohei do not get along, although she seems resigned to move forward in all the necessary ways. The father was a doctor, but old age and his failing health have forced him into retirement, resigning him to long lonely walks and much time alone in his once home office. When Ryoto arrives it is the mother’s seeming good nature that makes things bearable, despite the haunted memories and his father’s unhidden contempt for his career as an art restorer. Adding to Ryoto’s burden is the fact that he is currently unemployed and his shame will not allow him to discuss this with his parents. Although the story is shaped around the son’s disappointment, it is in the mother’s actions that emotional conflict and resolution are most fully explored. Events that at first seem benign, and even humorous, are revealed to carry coldly executed intention and even cruelty. Relationships that existed in seeming stasis for many years are seen from new and unexpected angles. Still Walking leaves us with a series of sometimes humorous and always moving impressions, as though we had been peering through window shades for the entire visit, watching the slow unraveling of a graceful but dysfunctional family, while also learning their deepest secrets. This entry was posted in Film Reviews and tagged Hirokazu Koreeda, Still Walking by Thomas W. Campbell. Bookmark the permalink.